Elvis Costello Gets A Little Bluegrass For the past three decades, English singer-songwriter Elvis Costello has been traveling the world, performing music of every kind. Here, he sits down to discuss the sound and themes of his latest album, Secret, Profane & Sugarcane. For the past three decades, English singer-songwriter Elvis Costello has been traveling the world, performing music of every kind. For his latest album, Secret, Profane & Sugarcane, he headed to Nashville and got a little bluegrass. Costello recently sat down with NPR's Scott Simon to discuss the album's themes. Costello's idea to make an acoustic-guitar record provided the inspiration for Sugarcane. In Nashville, he says he found "a very good environment for the kind of narrative song I had in my bag." Given the roster of session musicians available to him, it's no surprise that the album has a certain twang to it. Though Costello says he doesn't hear it as a bluegrass record, he notes that the instrumentalists with whom he collaborated hail from that tradition. Famed country singer Loretta Lynn shows up on "I Felt the Chill Before the Winter Came," a ballad the two co-wrote; Costello describes it as "our own spin on the familiar tale of... your ability to betray as you are betrayed." Sugarcane also reprises two songs — "Hidden Shame" and "Complicated Shadows" — that Costello wrote for country-music legend Johnny Cash. Cash never performed "Complicated Shadows," so Costello recorded a rock 'n' roll version of the song in 1996. But he says "the matters of the text needed to be held a little more closely to the chest than the rock 'n' roll version did," so he re-recorded it. 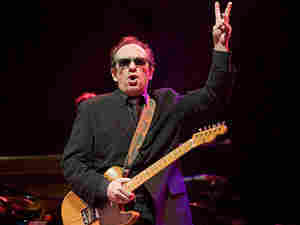 Costello also shares his feelings on the role of music in his life. When asked by a listener about his "secret to longevity in a business that seems wedded to one-hit wonders," Costello replies, "I have no clue. I never had any ambition other than to be some kind of songwriter. "Fame can be disappointing," he adds, "but music is rarely disappointing." 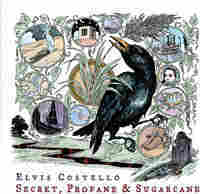 Costello describes the songs of Secret, Profane & Sugarcane as "harmonically quite simple." But in spite of their simplicity, the songs frequently deal with complex themes. "A lot of the songs end with a moral conflict or a moral dilemma," Costello says. "It just was the way in which the story of the record developed." Home Page For "Secret, Profane and Sugarcane"